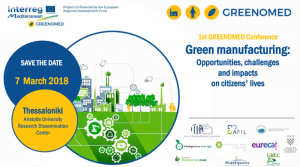 In the framework of programm INTERREG MED and of the project GREENOMED (https://greenomed.interreg-med.eu/), Interbalkan Environment Center (i-BEC_ organizes a Conference in Thessaloniki. The conference aims at raising awareness about green manufacturing and its opportunities and impacts on citizens’ lives through implementing green innovations in manufacturing industry. In particular, the first GREENOMED conference targets general public aiming to make aware normal citizens on their role in enhancing sustainable innovations and green technologies. The conference is organized into two parts: plenary morning sessions, and parallel sessions in the afternoon. The first morning session focuses on the reasons why circular economy and green manufacturing could enhance a better quality of life investigating the impacts on the everyday life of citizens. The second morning session will focus on the social and economic impacts that green manufacturing can bring to the society. In particular, the opportunities for job creation and local development as well as the skills and competencies will be the main topics of discussion during the second plenary session. If you would like to have further information, do not hesitate to contact us at greenomedproject@gmail.com.